Fred Eggen of Dave's World in Liberty uses a rake Friday afternoon to level up the gravel in order to fix one of the road washouts created by the heavy rainstorm earlier this week. 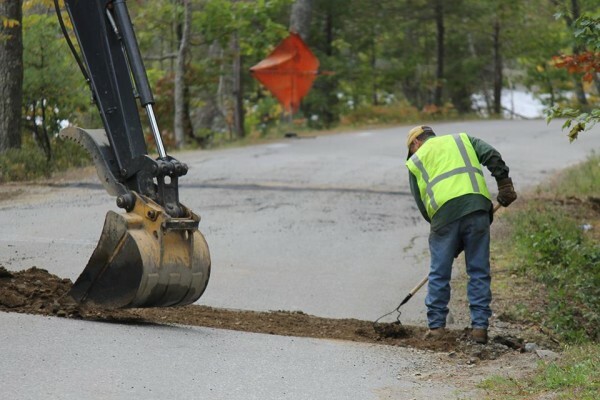 BELFAST, Maine — With more rain anticipated as Hurricane Joaquin makes its way northeast, officials in Waldo County are still dealing with roads damaged in the major storm that swept through Maine Wednesday and left washouts and broken storm drains in its wake. More than 5 inches of rain fell across most of Maine, with the National Weather Service recording the highest rainfall of 9.75 inches in Searsport in Waldo County, where the height of the storm coincided with high tide. On Thursday and Friday, crews took advantage of the dry, cooler weather to quickly repair infrastructure damaged by the heavy rainfall and runoff. State officials on Friday were glad to learn from the National Weather Service that Maine might not need to prepare for another round of drenching weather. The latest forecast models show that Hurricane Joaquin, downgraded Friday evening to a Category 3 storm, is predicted to stay well off the East Coast, and Maine Emergency Management Agency Director Bruce Fitzgerald said the state should not see significant rain or wind impacts. Still, officials cautioned residents to be prepared. The Reuters news agency on Friday afternoon reported that Joaquin was about 825 miles southwest of Bermuda with top sustained winds of 125 mph, according to the U.S. National Hurricane Center. The hurricane turned northeastward Friday and was expected to start gradually losing strength over cooler water over the next 48 hours, the NHC said. While keeping a close eye on hurricane forecasts, Rowley and other emergency officials in Maine were busy Friday adding up the damage from the midweek rainstorm to see if the state would meet the threshold required to declare a state of emergency. By early Friday afternoon, Waldo County already had exceeded the $180,000 needed for a Maine county to declare a state of emergency, with not all the towns having reported their repair assessments, Rowley said. Northport is estimating it will pay $150,000 to repair damaged roads. Prospect and Stockton Springs have reported $60,000 each. Hancock County also was seriously affected by the storm, including Bucksport, where schools were closed Thursday because buses couldn’t get through water-damaged roads. By Friday, though, all the schools in the Bucksport area were open. But Waldo County is the only Maine county that so far has met the repair threshold, according to Kathleen Rusley, public information officer for the Maine Emergency Management Agency. Overall, the state would need to show $1.9 million in damage to roads and public facilities in order to have the governor declare a state of emergency. If that happens, the Federal Emergency Management Agency would pay for 75 percent of the cost of repairs, with the state chipping in as much as 15 percent more. That would greatly reduce the costs to municipalities, but Rusley said it’s not clear that the rainstorm has caused that much damage statewide. While the rainstorm may not have left the same kind of lasting damage as other notorious weather events, such as the ice storm of 1998, Rowley said that the five to six hours of intense precipitation certainly wreaked some havoc. In Searsport, where several roads needed to be closed at the height of the rain — including parts of U.S. Route 1 — Town Manager James Gillway said that town crews have already repaired the damaged culverts and washouts. “We’re pretty much back up to normal,” he said Friday afternoon. In Liberty, Road Commissioner Tammy Reynolds said that they’ve found that some roads that initially appeared fine in fact were not. Road repair workers began fixing the problems on Wednesday, continued through Friday afternoon and expect to get back to it on Monday, she said, adding that the emergency repairs are finished. Rusley is hoping that storm chasers will not get hurt in the coming days, as Hurricane Joaquin passes to the east.